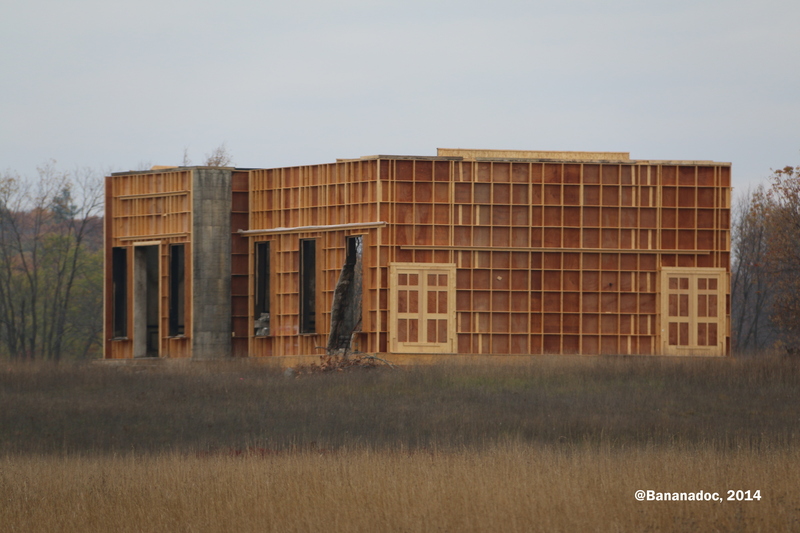 Filming of at least a couple of scenes of Batman V Superman happened in Orion Oaks County Park, Lake Orion, Michigan last week. 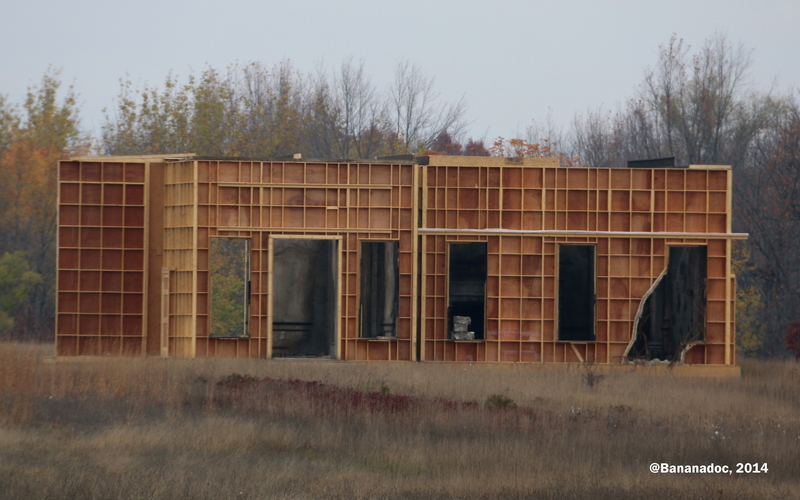 While everyone’s eyes were on the filming site in Metamora, and elsewhere, it seems that the BvS production had spent the last few weeks building structures in the park. I posted some of my photographs here on my blog, and others I shared via Batman News. When I shared my pictures I actually held some back, because they were kind of spoilery. I mean, everyone knows that Bruce Wayne’s parents are buried in a crypt near Wayne Manor, and that Bruce visits their graves. Not a spoiler! Other pictures I was less happy about sharing openly at this point. However, since then, a lot of other people wandering through the park have spotted the sets and published photographs, and there is a little confusion about what’s going on. So this is a clarification, with a few more pictures that are no longer secret. At the entrance to the set, in the middle of the public path into the park was a sign with two arrows, one pointing to MANOR and one to MAUSOLEUM. The structure on the hill, a dilapidated house of two rooms only, clearly destroyed and abandoned, is the MANOR. 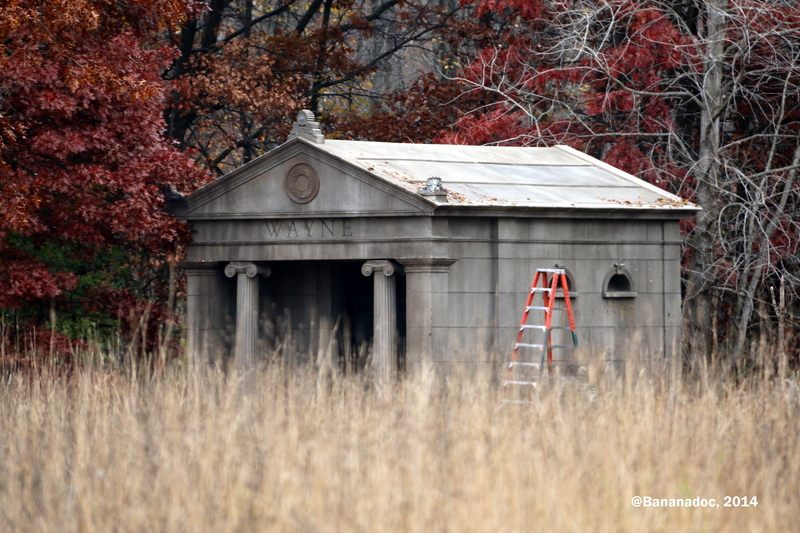 The obvious crypt-like building with WAYNE above the door is the MAUSOLEUM. Two sets. Whether they are related in the movie is anyone’s guess, though I do think it is possible to see the crypt from the window of the manor. In fact, thinking about it now, this is maybe why they did build this set here rather than in studio — precisely so that the crypt could be viewed across the bleak, grassy field from the manor house windows. 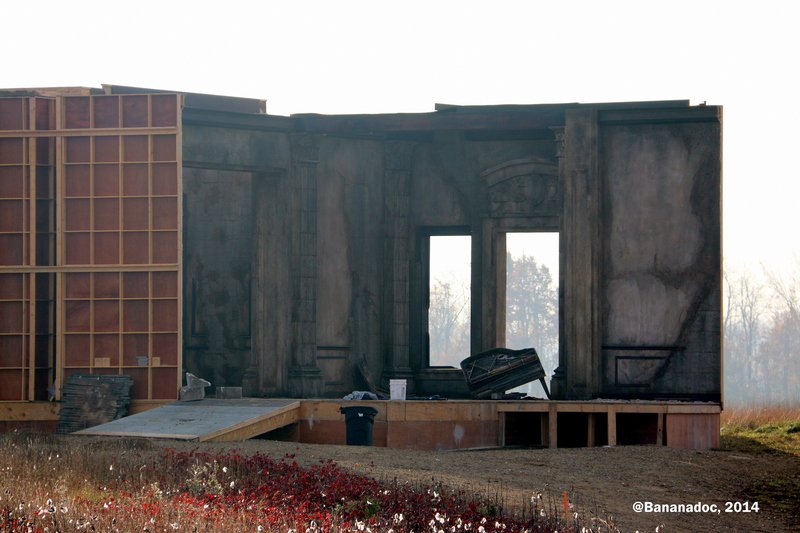 You wouldn’t film in the other direction as the outside of the ‘manor’ is clearly a movie set! So, is the abandoned structure actually what’s left of Wayne Manor…? I don’t know the comics and the storylines well enough to speculate. We have heard rumors that Bruce Wayne has left the manor and is living in a smaller cottage by a lake (the Metamora site?). So that would fit. Maybe. Above is the side of the ‘manor’ facing the crypt. If you zoom in you can see that vegetation is growing around and into the windows. Something bad definitely happened to this house! Again you can see the room on the right is damaged — window broken, wall partly destroyed, Inside everything is gray. Stonework is hard to make out but there’s a big stone fireplace on the far wall. Above is the ‘front’ of the house with the broken piano. My guess — fire damage. Maybe. I’d actually seen this building and assumed it had always been there! Unless you stopped to think how incongruous this is in a public park, you would just walk by. It looks 100% real and a 100 years old. Love the attention to detail. Do you remember the closest trail mark numbers of the above pictures. Thanks. I’m looking at an overhead map and my best guess is that the mansion was between marker 3 and 4 (up on the hill to the North) and the crypt was almost exactly at 4 (to the South just before the path goes into the woods).